Chinese icebreaker, Xuelong, or "Snow Dragon", sets off from a port in Shanghai bound for Antarctica, where it will establish China's newest base as Beijing strives to become a polar power, Nov. 8, 2017. China’s growing presence in Antarctica is causing alarm among some experts in Australia, which has big stakes in the resource-rich continent. A recent report from the nonpartisan Australian Strategic Policy Institute (ASPI) alleges that China has been conducting secret military activities in Antarctica and may be making a grab for land there. The report’s author, Anne-Marie Brady, a highly regarded political science professor at the University of Canterbury in New Zealand, says that China’s aims may be at odds with Australia’s strategic interests. Antarctica isn’t a country. It’s governed through an international treaty which was signed in 1959 by 12 countries whose scientists were working there at the time. China is a relative newcomer to Antarctica. It joined the Antarctic Treaty in 1983. According to the ASPI report, China is rapidly expanding its presence in a triangle-shaped area in the Australian Antarctic Territory. Chinese officials have stated in documents Beijing’s right to make a territorial claim. Antarctica, roughly the size of the U.S. and Mexico combined, is a mostly uninhabited, ice-covered land mass. Australia claims 42 per cent of the polar continent, the largest claim by far of any of the nations with a presence there. On the negative side, the National Science Foundation, which runs U.S. research programs in Antarctica, has decided that aging, inefficient buildings at the McMurdo research station must be replaced. The cost of replacing those buildings would almost certainly come to hundreds of millions of dollars, according to the New York Times correspondents in a report published by The Times on July 17. A more immediate issue, they say, is whether the U.S. Congress will allocate money for ice-breaking ships that would ensure that American bases in Antarctica can be resupplied every year. Meanwhile, China is now replacing Russia as the United States’ main competitor in Antarctica. China has four research bases, with a fifth planned. According to The Times’ report, the U.S. has three bases and multiple field camps, with an overall program still far larger than China’s. The McMurdo base, originally built by the U.S. Navy in 1957 during the early stages of the Cold War, houses more than 1,200 residents, the largest community in all of Antarctica. China hasn’t publicly explained its goals in great detail to foreigners, but Brady says that her Chinese contacts and Chinese-language research show that Beijing is looking for resources, including minerals, hydrocarbons, and fish. All of this fits into China’s strategic goal of achieving great-power status, according to Brady. As she explains it, China also views access to both Antarctica and the Arctic as essential for the rollout of the country’s BeiDou satellite navigation system, China’s space science program, and accurate weather forecasting in China. The BeiDou navigation system is based on “dual use technology.” This means that it can be used both for scientific research and for the guidance of offensive missiles. In a new book titled China as a Polar Great Power, Brady says that as far back as five years ago, in 2012, Chinese officials told her that the People’s Liberation Army (PLA) would increasingly participate in China’s Antarctic expeditions. The Chinese officials cited the precedent set by Argentina, Brazil, Chile, New Zealand, and the United States, all of which use their armed forces and contractors in Antarctica to help staff research stations and provide transportation and cargo handling. China’s decision to deploy its military, Brady says, would be legitimate if China were to publicly state that it is involving its military in Antarctic affairs. “Increasing the level of involvement of the Chinese military in the Antarctic program will greatly enhance China’s operating capability and enable PLA personnel to gain experience in operating in polar conditions,” says Brady. ASPI’s 2013 report said that Australia’s budget for Antarctic operations has faced crippling restrictions, with the overall budget for 2013-14 facing an eight percent cut from the previous year’s budget. It’s worth noting that in contrast with the Arctic region, Antarctica is one of the coldest regions on earth. According to CNRS, this includes cosmologists, geophysicists, space mission coordinators, and even psychologists pursuing research in their fields. And for astronomers, CNRS says that Antarctica is the world’s best earth-based observatory. According to the website World Data, Antarctica has the cleanest air with minimal background radiation. Cloud cover only rarely hides the stars. Research stations are spread across the continent, with a total of 70 permanent research stations representing 30 countries. 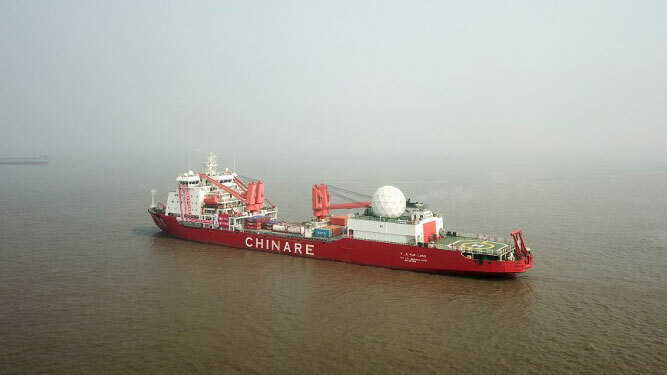 In her book, Brady says that the Chinese government “spares no effort to hide its designs on Antarctic mineral resources from possible foreign criticism to the extent of even deliberately mistranslating a speech” by China’s President Xi Jinping. One of the tasks assigned to China’s state media, which includes among others China Radio International and CCTV International, now known as China Global News (CGN), is to respond, usually indirectly, to international controversies about China. Brady says that in November 2014, when President Xi visited Australia, the Australian media were speculating over the implications of China’s expansion of its BeiDou satellite navigation system to Antarctica. The China Daily, China’s official English-language newspaper, avoided commenting on the controversy directly. It instead translated a quote from Xi’s speech given while he was visiting a Chinese icebreaker in port at Hobart, Australia. Brady says that China is assuming that foreigners won’t know what their leader is saying in the original Chinese and therefore not be aware that China’s goal is to exploit the continent’s resources. China’s expanding polar presence is explained to the Chinese public in Chinese as “being part of China’s efforts to secure a share of polar resources,” Brady says. In other words, the Chinese people, and not the just the scientists, will see a payoff from China’s presence in Antarctica. Meanwhile, environmental experts are focusing on what could go wrong with China’s many activities in Antarctica—regardless of whether they involve either exploration or exploitation. They’re particularly concerned with the potential impact of any mining or fishing on Antarctica’s marine life. Thanks to Brady and Southerland for highlighting China Daily's deceptive mistranslation of "exploit" as "explore" in Xi Jinping's statement about his plans for Antarctica. While most PRC scientists in Antarctica are more interested in exploratory research than in exploitation, the PRC government is definitely focused mainly on exploitation through activities such as mining and fishing.